. Live as though its a privilege, not your given right; no one's life is promised, your tomorrow isn't a guarantee. Love as though no one is watching. How you feel towards someone shouldn't be determined on how well they can reciprocate the feeling. Laugh as though no one is listening. Your happiness shouldn't be preponderant on someone's actions. Experience things that bring you joy. 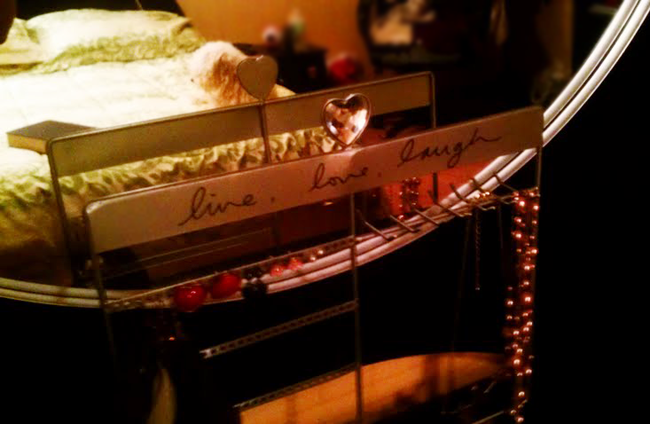 I purchased this little jewelry stand for only ten bucks at Wal-Mart today, in case you were wondering where it's from. My little fur ball blends in with my bedding! Happy Sunday to you all. Dalia, thank you so much for coming by my blog and commenting! I love your little space here on the web! I read your about me, and we sound so much alike :) I'm glad you have a place to express yourself! I love this quote and post! It was perfectly written. Thank you for sharing!